In early 2013 a group of researchers reported their findings on a novel influenza virus detected in swine from Oklahoma. Their research – published PLoS Pathogens – was called Isolation of a Novel Swine Influenza Virus from Oklahoma in 2011 Which Is Distantly Related to Human Influenza C Viruses, and it immediately caused a stir in the flu research community. Based on its genetic organizational similarities to influenza C viruses this virus has been provisionally designated C/Oklahoma/1334/2011 (C/OK). Phylogenetic analysis of the predicted viral proteins found that the divergence between C/OK and human influenza C viruses was similar to that observed between influenza A and B viruses. No cross reactivity was observed between C/OK and human influenza C viruses using hemagglutination inhibition (HI) assays. A new influenza virus, genus D, isolated in US pigs and cattle, has also been circulating in cattle in France. It was first identified there in 2011, and an increase was detected in 2014. The virus genome in France is 94%–99% identical to its US counterpart, which suggests intercontinental spillover. And yet another group of researchers from Europe published the following letter in the EID Journal on Friday. To the Editor: Recent studies have identified a new genus of the Orthomyxoviridae family (1–5). The virus, distantly related to human influenza C virus, has been provisionally designated as influenza D virus. This novel virus was identified for the first time in pigs with influenza-like illness (1), but subsequent serologic and virologic surveys have suggested cattle as a possible reservoir (2–4). Moreover, the virus was shown to infect ferrets used in laboratories as surrogates for humans when investigating influenza infection (1). In a serologic study conducted on 316 human samples, low antibody titers and a low level of positive samples (1.3%) were detected (1), suggesting that humans are a possible host to be studied in depth. To investigate the circulation of influenza D viruses among pigs and cattle in Italy, we performed biomolecular and virological tests on clinical samples collected from respiratory outbreaks in Po Valley, the area in Italy with the highest density of swine and cattle farms. We screened clinical specimens from swine (n = 150) and cattle (n = 150) for influenza D virus by reverse transcription quantitative PCR (1). Three nasal swab samples were found positive: 1 from a sow and 2 from cattle, collected from 3 farms located at linear distances ranging from 47 to 80 km. All positive samples were confirmed by partial polymerase basic 1 gene sequencing and submitted to viral isolation in cell cultures as previously described (5,6). Our findings show that influenza D viruses circulate among swine and bovine herds in Italy affected by respiratory disease. Genetic analysis highlights that the swine and bovine influenza D viruses are very closely related, both belonging to the D/swine/Oklahoma/1334/2011 cluster. Further studies are ongoing to better understand the epidemiology, virology, and pathobiology of influenza D virus in swine and cattle, especially concerning the evidence that Koch’s postulates are fulfilled for this agent. Implications in zoonotic aspects of influenza D virus infections will be also considered in ongoing research. Each year we seem to add either new flu subtypes (or in this case, genus), or we expand the known host range for these viruses. In 2012, in A New Flu Comes Up To Bat, we learned of both a new – never before seen H17N10 subtype - and the addition of bats as hosts for influenza A. The following year another bat flu, H18N11, was added to the list. We’ve also seen several new subtypes of Influenza A (H7N9, H5N6, H10N8, H5N8, etc.) 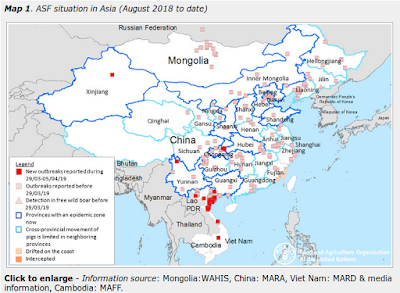 emerge in the past three years, a new canine (H3N2) influenza virus arrive from Asia , and two different HPAI viruses emerge in seals (avian H3N8 and H10N7). Proof I suppose, that the more you look, the more you are going to find. While the zoonotic potential of this Influenza D virus is - as yet, unknown – its ability to infect and transmit in ferrets is considered a red flag. To be a genuine threat, however, it would have to be pathogenic enough in humans to produce significant disease. To date, we’ve not seen any evidence of that. The caveat being that influenza viruses are constantly evolving (particularly Influenza A), and so the future course and pathogenicity of Influenza D is pretty much anyone’s guess.